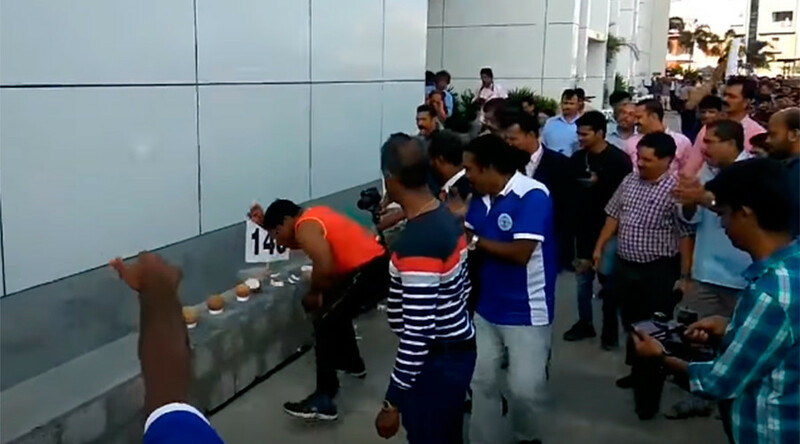 A Indian man declared war on coconuts, smashing 124 in under a minute in an attempt to set a new world record. Abeesh Domanic can now rest his fist with pride, knowing he easily beat the previous mark of a mere 118. In total the 25 year old took on 145 coconuts in less than 50 seconds but not all were fully smashed resulting in a reduced tally. His powerful display happened in front of amazed onlookers at Sobha City in Thrissur, reported Manorama. Domanic’s hands of steels have been used in breaking records before – he smashed hockey helmets with his fists. He also pulled a bus 50 meters using only his teeth – in a testament to the power of his toothpaste. German Muhamed Kahrimanovic will have to get back training if he wants to reclaim his title from Domanic. His 2013 record of 118 smashed coconuts differed to Domanic as it involved a controversial two-fisted technique. Attempting to break records is a dangerous business and shouldn’t be taken lightly. Just ask this guy – who tried to set the record for number of watermelons broken with his head. Ouch.